Summer’s almost here! It’s finally time to let loose and add those extra punches of colors to your look! I’m going to be jumping into the summer with these InstaTint temporary shimmer hair color sprays from Joico. The possibilities are endless with these colors. You absolutely have to utilize the stencils that come in the box and create fun shapes in your do’. Today I’ll be creating a rainbow ombre! The colors blend together really well. You can control the blending by spraying short pumps about 8 inches away from your hair. The colors dry pretty quickly, within a few minutes, so make sure you work quickly. Once the spray is on your hair, it’s not coming off without some water so spray wisely! The vibrant spectrum of colors had bold and beautiful shimmer and tones. 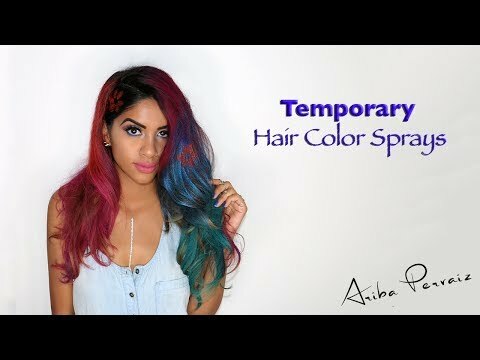 The color sprays are guaranteed to last up to 3 days in your hair. If I hadn’t shampooed my hair out on day 3 I’m pretty certain I would have gotten a few more days out of it. The temp hair color feels like a strong hold hairspray and it doesn’t budge. There was no transfer from my hair onto my furniture, clothes, or pillowcases once the hair color was completely dry. Any moisture in my hair did cause transfer so make sure you keep your hair nice and dry when using these sprays. I created bouncy curls to be the perfect backdrop for my fun new hair color! I used a 32mm wand and rolled the curls around my fingers and clipped them into place. Once they were completely cool, a quick blast of hairspray guaranteed long lasting curls! After several minutes I unravelled bouncy waves that lasted me all week long.